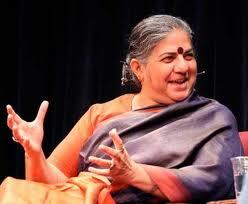 Nobel Peace Prize honorees: why not Vandana Shiva? 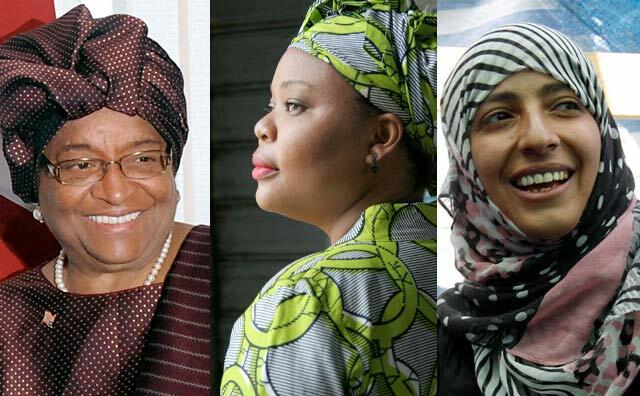 How can I complain when the Nobel committee saw fit to grace not one but three women, two from Liberia and one from Yemen, with the annual Peace prize? After all, I’ve been working for years now to help the women of the two-thirds world gain more power and recognition, and these three women–the towering elder and current President of Liberia, Ellen Johnson Sirleaf; Leymah Gbowee, the Liberian peace activist familiar to many from the portrait of her in the powerful documentary film “Pray the Devil Back to Hell”; and the young Yemeni human rights activist Tawakkol Karman– are certainly very deserving. All three of this year’s Nobel Peace Prize winners have been channels for the hopes and dreams of their people, seeking political empowerment, social stability and security, and a sustainable path forward out of chaos (in Liberia’s case) and stagnation (in Yemen). 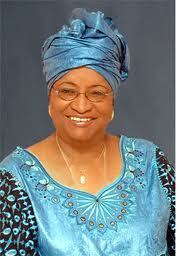 Ellen Johnson Sirleaf, who holds a Master’s degree in Public Administration from the Kennedy School of Government at Harvard, has done a lot of good things for her people in her tenure as President, including many development programs aimed specifically at empowering women. She has succeeded in gaining major debt relief from Liberia’s creditors, as well as brokering deals with big transnational energy companies to extract Liberia’s oil. The other two Nobel Peace Prize honorees are equally deserving. 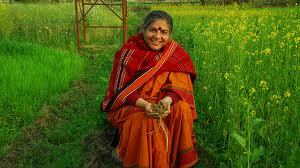 But I wish the Nobel Committee had been a bit more forward-thinking, and seen fit to honor another woman from the two-thirds world, Vandana Shiva of India. A Ph.D. in particle physics, Shiva has been way ahead of her time for most of her life. Instead of taking her place comfortably in the ranks of the Indian elite, Shiva became aware as a young woman of the danger of the industrialization of agriculture in India. She founded an organization, Navdanya, dedicated to saving heirloom seeds and preserving the knowledge of how to farm using ancient, local, sustainable methods. When Monsanto began moving aggressively into the Indian market, luring in farmers with fertilizers and GMO seed on credit, Vandana Shiva was just about the only one who seemed to perceive the huge risk they were taking. When these same farmers began committing suicide in droves as their reliance on foreign seed, fertilizer and pesticide drove them inexorably into debt, Vandana Shiva was the one who went to court to defend their lands and the rights of their widows. 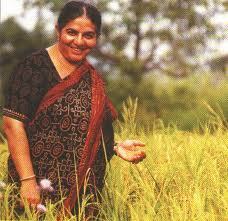 She has been a veritable David fighting the Goliath of Monsanto for the past twenty years or so. And in many cases, she has won! While I also honor Ellen Johnson Sirleaf and her younger co-awardees this year, I have to say that I would like to see them follow more in Vandana Shiva’s footsteps in the future. 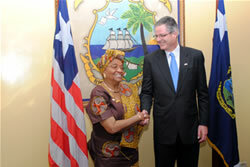 Take Liberia, for instance, which in 2010 ranked 162 out of 169 countries on the United Nations Human Development Index. Ellen Johnson Sirleaf is busy signing agreements with Chevron to extract the country’s oil, and hoping that some of the oil wealth will trickle down to ordinary Liberians, who are still hungry and poor today. I’d like to respectfully suggest that instead of selling her soul to Big Oil, President Sirleaf follow the example of Vandana Shiva, and look to local, sustainable agriculture and manufacturing to build her country’s economy. In a time of rapid climate change, it’s the countries and regions that are most self-sufficient and least plugged into the fossil-fuel-driven global economy that are going to be able to ride out the coming maelstrom. Carbon Dioxide Removal (CDR): CDR strategies aim to remove greenhouse gases from the atmosphere, thereby addressing the root causes of climate change. Solar Radiation Management (SRM): SRM strategies aim to counteract or mask the effect of rising greenhouse gas concentrations in the atmosphere by increasing the amount of solar energy that is reflected back into space. The first method involves working with plants that will absorb more carbon dioxide, or finding ways to sequester the CO2 we produce back underground. One could hardly argue with an aggressive tree-planting and conservation campaign, particularly in light of the appalling reality of deforestation across the world today (see this very cool interactive map for the gruesome details). 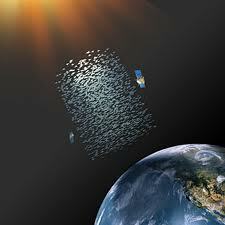 The second method is the environmental equivalent of Ronald Reagan’s infamous Star Wars missile defense system: a sci-fi-esque plan to install giant mirrors in space, or to seed the atmosphere with reflective particles that will deflect solar rays from Earth. One can just imagine the military industrial complex salivating at the thought of such a project, particularly at a time when there is so little support for continuing the wars that are this industry’s usual diet. The problem, of course, is that both of these approaches miss the central most important fact about climate change, which is that nothing will stop it other than aggressive changes to our carbon-based lifestyle. Will that happen? Can it happen in time? Maybe the Occupy Wall Street movement can bring the necessary energy to this fight, and I certainly hope they do. Recently Bill McKibben’s 350.org, a leader in climate change activism, became one of the many larger national organizations seeking to ally themselves with this young juggernaut of political action. Meanwhile, so-called “less developed nations” like Liberia and Yemen and all the rest should seriously re-evaluate their acceptance of this designation, which means rethinking the whole rationale behind Western-style “development.” Development, Western-imperialist style, has benefited a few people mightily but brought suffering to the vast majority of people on Earth, especially those in the areas of greatest resource extraction, which are, paradoxically, the “less-developed” nations. Now the time has come for us here in the heart of Empire to feel the blowback from our aggressive policies of development. Climate change is upon us. And in this new era, it is precisely those with the least reliance on oil, electricity and industrial agriculture that will have the best chance of adapting to the new realities of life on Earth. President Johnson Sirleaf and all the other leaders of “less-developed nations” should stop and reconsider their friendships with the global corporate elite. The urgent task now is to build resilient communities and economies based on the exchange and consumption of local resources–just like it was for the tens of thousands of years of human existence before the industrial revolution started us off on a different path. It is people like Vandana Shiva, who are still in touch with older ways of living in harmony with the Earth, who may be able to lead us through the current crisis into a sustainable future. 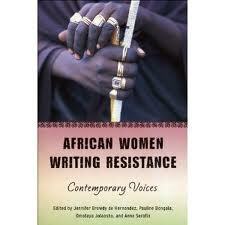 Let us take heed while there’s still time. Let’s take back Black Friday, and change history! Occupy Wall Street: Finally, the New York Times Gets It!! Now, how about Obama?